When your feet start bothering you everything else on a hunt can go downhill quick. Getting good hunting socks is a good first step to make sure your feet aren’t the limiting factor on your next hunt. One of the biggest causes of a failed hunting trip are cold, wet and sore feet. That’s why hunters are so willing to invest major amounts into hunting boots. That’s why I’ve spent more than a decade trying out different boots and switching to different options whenever finding something better. Boots are given so much focus, that most people don’t even realize they aren’t giving their socks enough attention. Hunting socks are nearly as important as the boots are, and if quality socks aren’t used your trip won’t be a pleasant one. Good hunting socks don’t just come in one variety though. There’s different hunting conditions and different requirements. Obviously they should be tall, since nearly every pair of hunting boots is tall. They also have to be warm, but how warm depends on where you’re located and what your needs are. As a sock connoisseur of sorts I’ll review a selection of hunting socks from different manufacturers. Some of these socks are warm enough to take on the Arctic, others are more suited to a Fall day with just a slight amount of chill in the air. Keep this in mind when picking out the socks that you’ll use for your hunting trip. Deciding on the right hunting socks is something that you shouldn’t rush through. Taking your time to choose a quality produce will ensure that you have just what you need for a good quality hunting experience. Take your time and review the below options with me, and you just might stumble on your new favorite hunting buddies. Who knows, they could transform that pair of lackluster hunting boots you’ve been meaning to replace into a solid tool that does everything you need it to. Socks make that big of a difference. Warmth – The right pair of hunting boots will give you most of the warmth that you need to be outdoors, but it’s still important to get socks that will keep your feet nice and toasty. 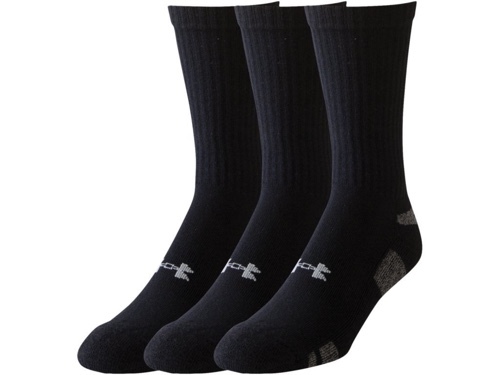 Moisture Wicking – This is arguably the most important factor of hunting socks. You don’t want soggy feet, so they need to be able to wick moisture away and keep your feet dry for extended periods. Support – Hunting is often an extended hike across miles of land. During that time you want to be wearing comfortable footwear, and socks offer support just like the boots do. Look for something with a bit of arch support if you can. Comfort – You don’t want socks that are too itchy, too tight or too anything else. They need to be just the right balance for maximum comfort, otherwise you won’t want to wear them all morning, or for more extended hunts. When it comes to hunting socks, Merino Wool is one of the best materials to invest in. It’s exceptionally warm, antimicrobial and keeps feet smelling fresh longer. Not only that but it helps wick away moisture as well allowing feet to breathe. 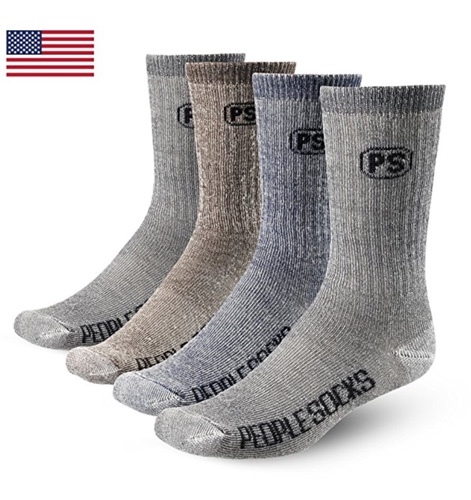 These socks from People Socks are affordable and they offer a good balance between comfort and warmth. They’re made with 71% Australian Merino wool and a blend of other materials. They also come fitted with a reinforced toe and heel for added strength and durability over time. 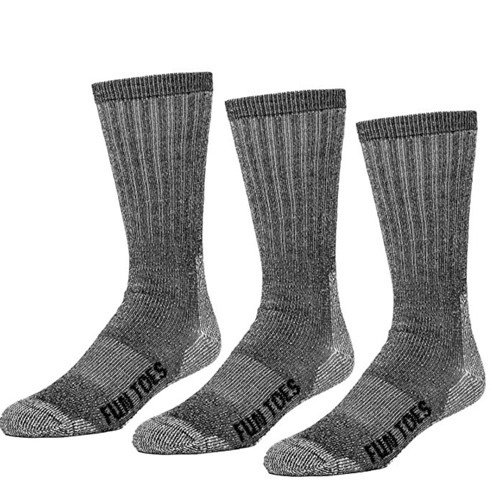 For hunters looking for a good value on their socks, this product from Fun Toes is worth a look. The socks come in a three pack, and each is made primarily of Merino Wool. The socks are toasty warm, though they are a bit thinner than some of the more expensive wool socks on the market. They provide decent arch support, probably thanks to the blend of wool, nylon and spandex that creates that nice stretchy feel. At first these socks will feel large, but after washing a time or two they shrink down and fit more snugly. They’re an excellent value and toasty warm for cold hunting conditions when paired with the proper pair of boots. These Carhartt Men’s Arctic wool socks are made to stand up to some of the coldest temperatures you’re likely to encounter while hunting. Sure they won’t keep your feet warm without a suitably high quality pair of hunting boots to pair with them, but they’re very thick and some of the highest quality wool socks on the market today. The socks are particularly good at wicking away moisture and sweat and reliable for keeping feet dry while within a boot. They feature reinforcing fabric at both heel and toe, to cut down on abrasion during use, and most people report them holding up well over time. The socks can be worn on their own, but pair well with a boot liner and an appropriate set of boots as well. They’re machine washable and a good companion for any outdoor activity that involves a pair of boots. Just keep in mind that the tops are tight and buyers with above-average calves might find the fit constricting. For warmer hunting conditions, these Under Armour Men’s HeatGear crew socks offer a good mix of support and performance that helps improve the hunting experience. They have a nice snug fit that provides support to the foot, though some users complain they are too tight around the calves. The socks aren’t nearly as warm as wool socks are, but they do offer warmth on chilly days. If you go out hunting before the days grow too cold, these socks will keep your feet comfortable in your boots and help you avoid getting overheated. 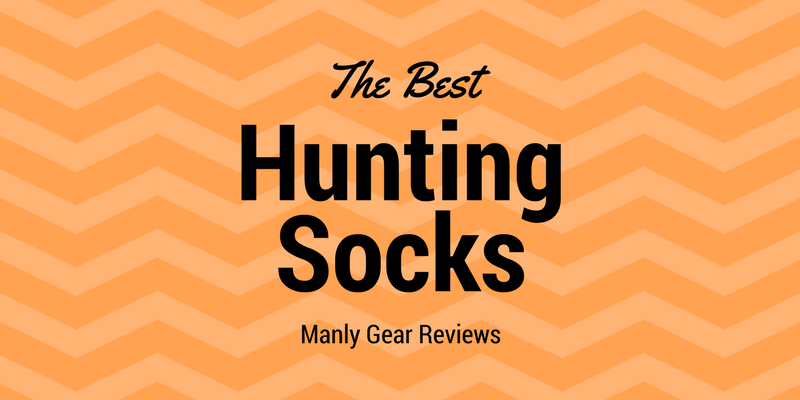 They’re made from a blend of nylon, spandex, cotton and polyester, and have an entirely different feel than any of the other hunting socks on this list. Sure they aren’t for extreme weather, but they’re one of the most comfortable options for lightweight use. 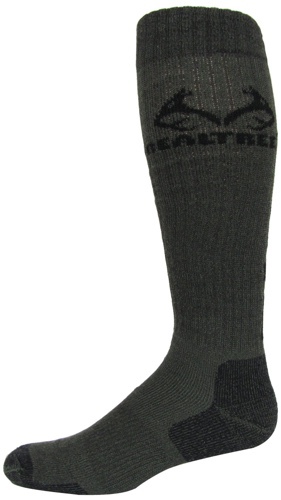 These Realtree Outfitters boot socks are an effective tool to keep feet warm while hunting and they look good too. They’re reinforced at heel and toe locations and made to hold up over regular use. The socks aren’t compression and have a comfortable fit without being too tight. They are made from a mix of 75% polyester, 23% nylon and 2% spandex and they’re comfortable and warm, without being hot. 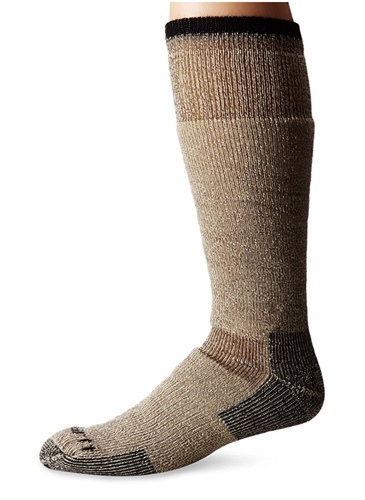 These socks are mid-weight hunting socks that are good for chilly days, without being practical on the coldest days. They keep your feet nice and dry and wick away moisture effectively throughout the day.